We are located in Wicklow Town, centrally located with parking just around the corner, so why not come visit us in store. 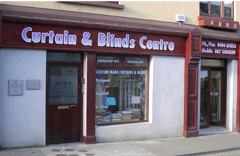 Curtain & Blinds Centre was established just over 25 years ago. As a long established business, we offer a service which deals with every detail of your order in an efficient manner. Our staff are very pleasant and will strive to help you in any way possible. Assistance in the selection of fabric to suit your décor. An excellent make up service by highly experienced curtain makers. A great selection of rails, poles, wood / brass / ironworks / electrically operated rails with timers and remote controls. Having selected your fabric and rails we offer a fitting service by our own experienced fitters. Copyright © 2008 Curtain and Blinds Centre.